Remember Clark Griswold, Chevy Chase’s character in Christmas Vacation? He painstakingly covered his property with 25,000 Christmas lights, with the goal of creating a magnificent holiday display (while driving his family and neighbors crazy in the process). Just like in this classic holiday movie, many local families across New Jersey produce stunning light shows that would put Griswold to shame. Many of these homes will have music playlists synced to radio frequencies that play in tandem with the lights, enabling you to listen from your car (as if you haven’t heard Mariah Carey’s “All I Want for Christmas is You” two dozen times by now). In addition to private residences, many of your favorite NJ family friendly attractions also create festive Christmas events during the month of December. There’s nothing better than loading up the car, driving around and gazing at tens of thousands of twinkling lights as they light up the winter sky. It’s a tradition that many families enjoy to get in the holiday spirit. Do you know where to go for the best light show in town? We’ve compiled the definitive guide to Christmas light displays in NJ for the 2016 season. You’ll find exactly what you need for your trip to one of these illuminating spectacles. Find the locations of each display, as well as dates and times when the lights will be on. We’ve also included some helpful tips and essential information to make the most of your visit to each attraction. Editor’s note: Many of these light shows are weather permitting, and may not be conducted if deemed unsafe due to inclement weather conditions. As always, many of these light shows are subject to change without notice. Be sure to check the website or Facebook of each light show for updates. About: This residential light display was created by Daniel Eisenberg in memory of his mother Lena, who passed away in 2010. All donations will benefit the America Heart Association. The lights are synchronized to music that you listen to from your car. Know Before You Go: Turn your radio dials to 98.1 FM. Lights on Evergreen has crafted a great playlist of seasonal music and pop/hip-hop hits. There are also plenty of other houses in the neighborhood that have lights up, though none are as impressive as the Eisenberg family’s. Dates and Times: TBA, 5pm – 10pm. About: Same show, different location! Formerly of Denville, NJ, the Mission Holiday Lights are a can’t-miss holiday light display in Northern NJ. 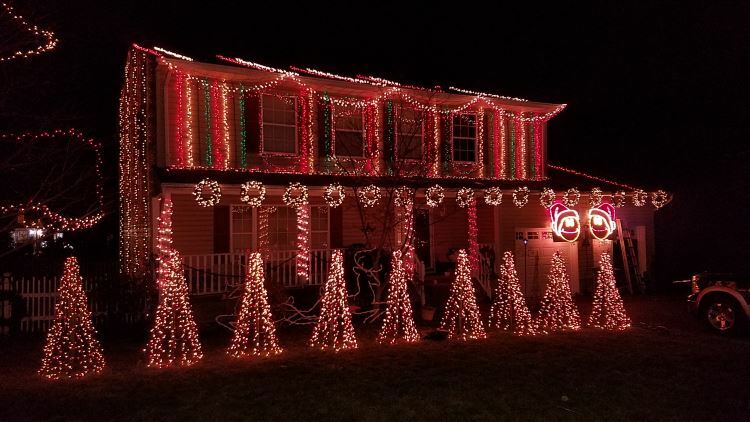 Not only does this family erect an enormous display for Christmas, but they also put together a legendary show for Halloween as well. They also collect donations for St. Peter’s Orphanage of Denville, NJ. Know Before You Go: Tune your radios to 88.1 FM to listen to the music from your car. Dates and Times: December 1st – January 1st, Sunday – Thursday 5pm – 9pm, Friday – Saturday 5pm – 10pm. About: Now in its fourth year, Christmas on Vanore will illuminate the neighborhood in Fairlawn, NJ. 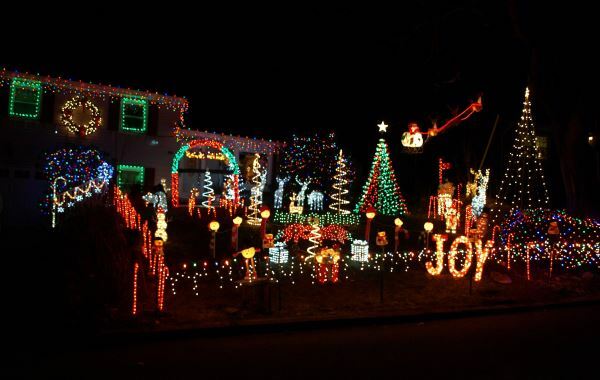 Last year, this spectacular display won NJ.com’s Best Holiday Lights in NJ contest. Know Before You Go: Their playlist features all of your favorite Christmas songs, from Sinatra to the Ramones. The playlist runs for one hour and 20 minute cycles. After the playlist ends, the lights will shine for 90 minutes in custom animation. Tune into 88.9 FM to listen along. Dates and Times: TBA, Daily, Dusk – 10pm. About: The Park Avenue Holiday Lights are continually adding to their collection. Each show is different year and after year. These holiday displays are made up of a variety of different decorations, such as inflatables, props, molds and synchronized lights. if you can’t wait until December, this house also creates a spine-tingling display for Halloween. All donations benefit charities and organizations, such as Spirit of Children and Ginnie’s House. Know Before You Go: Although this tradition has been around since 2003, join them at their new location at 24 Park Avenue in Newton, NJ! Dates and Times: November 28th – January 1st, Daily, 4pm – 12am. About: The Matorana Family of Wayne, NJ has created a veritable winter wonderland on their property. Starting this year, the Matorana Family will be accepting donations for families in need. Please considering bringing an unwrapped toy or gift. Know Before You Go: The lights ignite at 4pm, but the inflatables spring to life at 8am and are on during the day as well. This year, there will be a Gingerbread Corner beneath the Gingerbread Archway where children can write their own letters to Santa and drop them off in a very special mailbox that delivers right to the North Pole! Dates and Times: November 20th – January 1st, Daily, 5pm-10pm. About: Every year, the Vargo Family decorates their house with over 35,000 lights that play to holiday music. They collect donations for Toys for Tots. See spectacular arches, shimmering draped lights and illuminated snowflakes. Know Before You Go: If you plan on donating a toy, please do so by December 16. Help them reach their goal of 1,000 toy donations. Dates and Times: December 9th – January 1st, Sunday – Thursday 5pm-10pm, Saturday – Sunday 5pm – 11pm. About: The Tomasi Family of North Haledon, NJ knows how to put on a professional-level holiday production. They have been putting together themed light displays since 2012. Last year, “The Force Awakens” Star Wars-themed light show was a smash hit. This year’s theme? Extravaganzalorious, from the wildly popular Elf on the Shelf. However, Star Wars fans need not worry – last year’s featured EDM/Dubstep song “Imperial March VIP” will be playing this year as well, in honor of Rogue One. Know Before You Go: The lights shine silently for 90 minutes after the show. New additions to this year’s show include 8 by 30 foot arches covering the driveway and a 6.6 foot pixel tree that is something you have to see. Each production is carefully crafted a year in advance, so you won’t want to miss this. Dates and Times: November 27th – 29th, December 4th-6th, December 11th – January 3rd, 5pm – 9pm (Closed Christmas Day and New Year’s Eve). About: The Turtle Back Zoo welcomes you to their annual holiday light show. See 50 animals and dozens of winter images lit up at the zoo and the nearby South Mountain Recreation Complex. Several exhibits will also be open to the public. Know Before You Go: Admission is free, but visitors are encouraged to bring non-perishable food donations, winter coats and unwrapped toys. Additionally, the Turtleback Zoo will be hosting so many fun events during the light show, such as ice sculpting demonstrations, story time with Mrs. Claus, princess visits and a holiday gift bazaar. Dates and Times: December 1 – January 6th, 5pm – 11pm (will stay on until midnight or later nearer to Christmas). About: If you are in Florham Park, NJ this holiday season, be sure to stop by Marino Pazzini’s house. Nearly everything in this display is carefully constructed by hand. This includes the 16-foot tree, eight columns, arches and an illuminated bridge that spans the 20-foot driveway. No wonder this house was featured on Fox News! Know Before You Go: Many of the light displays on this list run until New Year’s, but Marino Pazzini’s Christmas Illuminations runs until Little Christmas on January 6th. Dates and Times: December 1 – December 31st, Monday – Saturday 10am – 8pm, Sunday 11am – 5pm. About: Since 1972, the Christmas Ice Caverns has been a beloved yearly tradition. This animated walk-through display, located inside Jodi’s Silk Florist and patio Center, is the largest of its kind in the area. Walk through dozens of realistic displays, such as the Nativity scene, Santa’s candy factory and much more. Dates and Times: December 8th – January 1st, Sunday – Thursday 5pm – 9:30pm, Friday – Saturday 5pm – 11pm. About: Welcome to the Morris Holiday Lights. Nearly every square inch of this house is illuminated with 40,000 beautiful, twinkling bulbs. 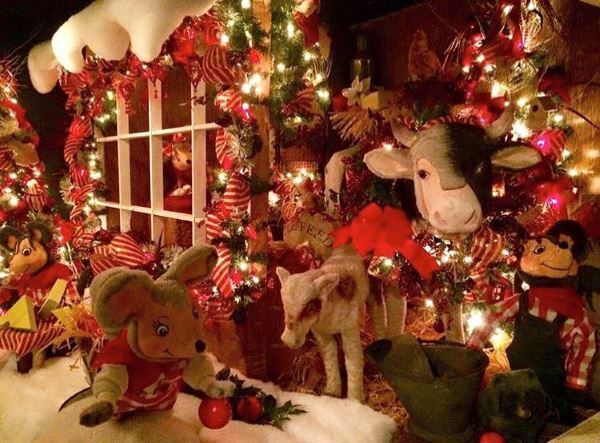 A visit to this Morris County, NJ home will be sure to put you in the holiday spirit. Know Before You Go: From December 23rd – 25th, this light show will run until midnight – perfect for a late-night drive while you’re waiting for Santa to arrive.